The Grow Solar team has reached out to 14 communities, 10 of which have made a commitment to participate as Growing Solar Communities, with the remaining two having expressed an interest in participating. 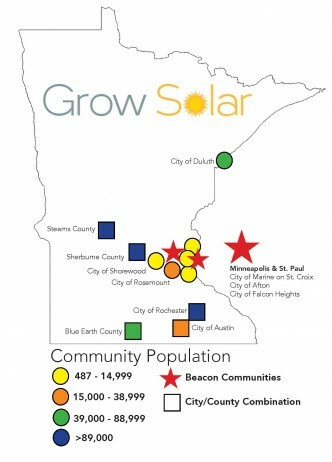 Minnesota participation will include, with its two Beacon cities, the four largest cities in the state, a geographic distribution that should provide Growing Solar Community leadership in all solar markets and a combination of large and small cities and rural and urban counties. Grow Solar partners have identified several additional larger suburbs in the metropolitan region that could add to the market visibility of best practices, and are investigating opportunities for soliciting participation. Duluth and the Rochester/Olmsted County programs have cross-over influence in Wisconsin, as do two river cities, Afton and Marine on St. Croix.